Like using Chicago’s Dennis Gentry on kickoff returns? Well forget it, because in TB Japan, he’s been replaced by the slower Mark Green. Note 1: Like football games? Check out my reviews of Football Frenzy, SEC Tecmo Bowl, Tecmo Super Bowl College, and Tecmo Bowl Arcade! Note 2: This game was played on an NES 101 model (toploader) that was modified to output in AV composite (red, yellow, white) just like the original NES. It was connected to a 32-inch HD tv. Because Famicom (Japanese NES) games won’t play on NES consoles directly, I made a converter out of an old copy of the NES game Gyromite that allows Famicom games to be played on the NES. Quick History: Wait, how is this obscure? Everybody knows Tecmo Bowl?!! Probably not this version. Tecmo Bowl USA, which is revered nationionwide, was released early in 1989 to the delight of football fans. Almost 2 years later, at the end of 1990, an ‘updated’ version was released only in Japan for the Famicom. 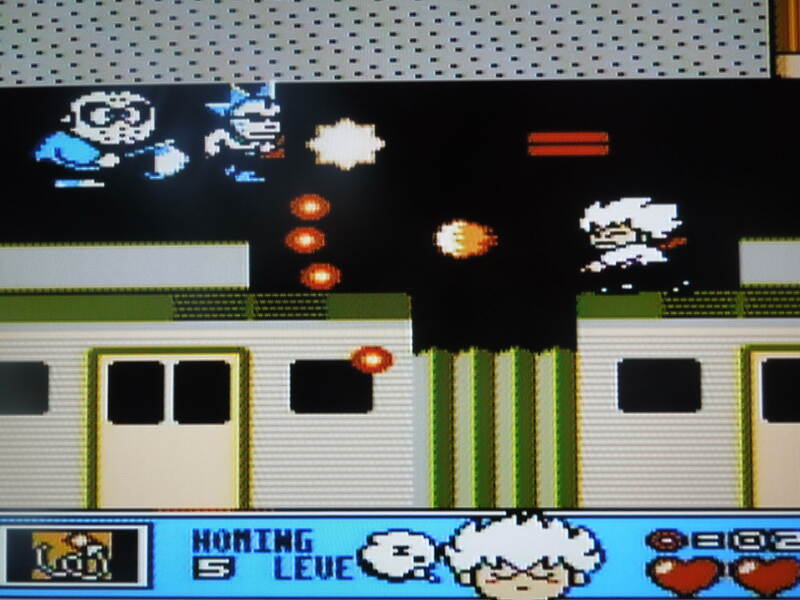 Not much was changed – the same 12 teams that are in the U.S. version appear in the Japanese version. Each team still has the exact same playbook in both versions. What changed were some of the players on the team. For example, in real life, Mark Green didn’t play for Chicago in 1988 when Tecmo Bowl USA was being created – therefore, he’s not in the game. However, in the 1989 draft, Green went to Chicago. 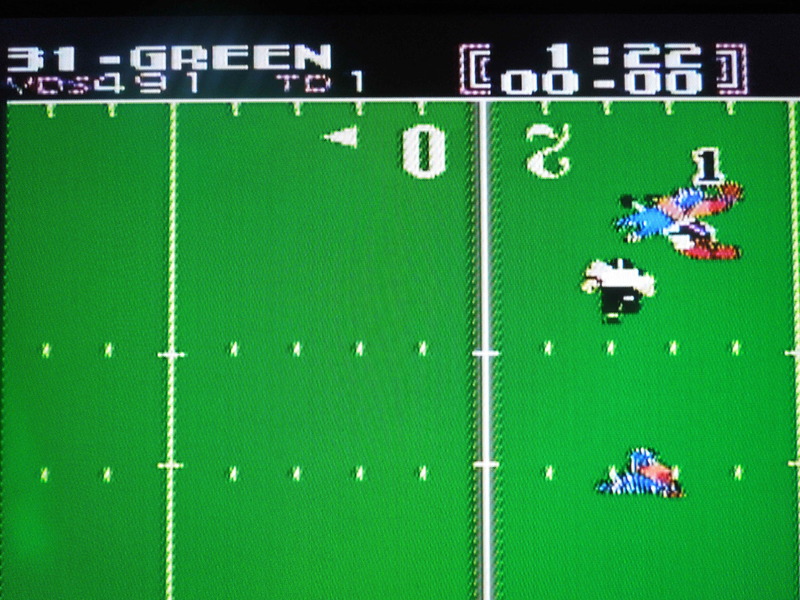 Therefore, in Tecmo Bowl Japan, Green is now on the team as a kick returner, taking the job of Dennis Gentry. It wasn’t just a name-switch for many players either – some teams got weaker or stronger based on the changes that were made. About Tecmo Bowl Japan: I’m not going to spend a lot of time on control, gameplay, etc, because Tecmo Bowl is one of the most well-known games of all time. If you don’t know about it, there are dozens of websites on the Internet dedicated to it. This review will focus on how Tecmo Bowl Japan is different from Tecmo Bowl USA. 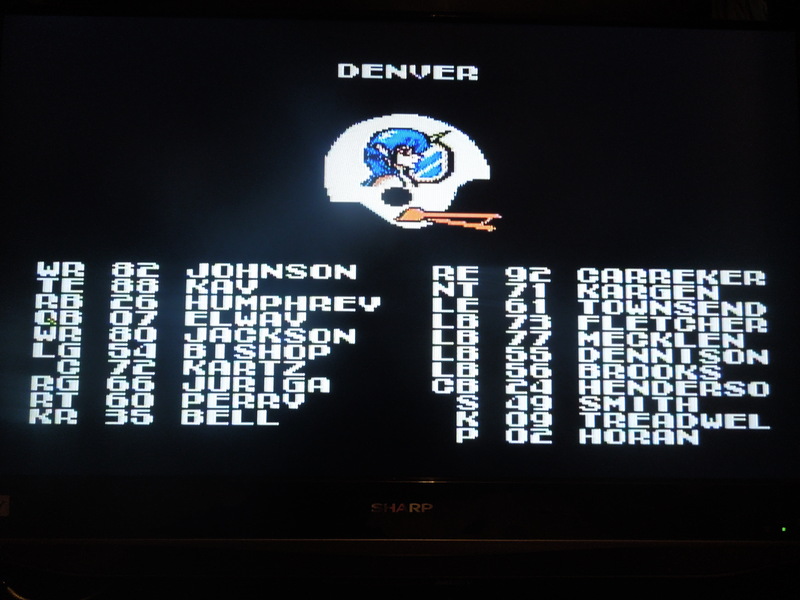 Denver’s USA roster, circa 1988. Denver’s Japan roster, circa 1990. Speedy John Taylor replaces slow Mike Wilson for San Francisco in TB Japan. 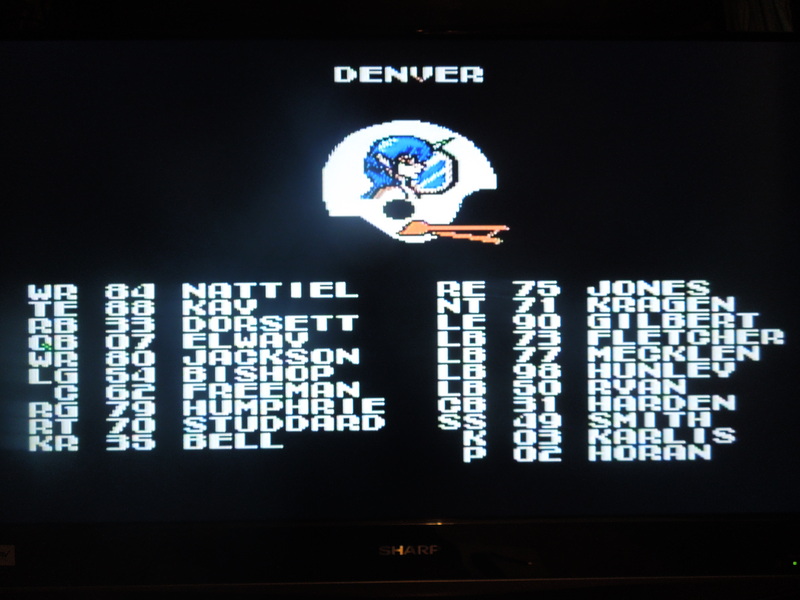 Small difference: When you boot up Tecmo Bowl USA, you’ll see ‘1988.’ When you boot up Tecmo Bowl Japan, you’ll see ‘1990.’ If you don’t press Start and let the screen scroll through the teams, you’ll see that every roster has changes made from the USA version to the Japan version – some teams had more changes than others. 1. On Chicago, Mark Green replaces Dennis Gentry as a kickoff returner – this stinks. If you like playing as Chicago, Gentry’s return game was unbeatable – he was so fast that scoring touchdowns on kickoffs was quite easy. Mark Green has only average speed, so even crossing the 50 isn’t a given. Luckily, Gentry is still on the team as a wide receiver. 2. On San Francisco, John Taylor replaces Mike Wilson at receiver – this is awesome. Mike Wilson was extremely slow and usually got tackled quickly after catching the ball. Taylor, however, is extremely quick, and is an amazing compliment to fellow wide receiver Jerry Rice, who is still extremely fast. With these two speedy receivers, San Francisco is almost perfect. 3. On Los Angeles, BO JACKSON IS EVEN FASTER IN THE JAPAN VERSION THAN HE WAS IN THE USA VERSION!!! I read this somewhere years ago, and always wanted to find out if it was true. I played both games and selected Bo’s 1 and only running play multiple times in both the Japan and USA versions. He is definitely faster – you’ll really notice if you play both games back to back. In the USA version, it was a good bet you could take it to the house as long as the computer didn’t pick your play, and you might have to dodge some defenders towards the end of your run. But in the Japan version, his acceleration and top speed are so ridiculous that you’ll rarely have to dodge any defenders – 3 yards and a cloud of dust. 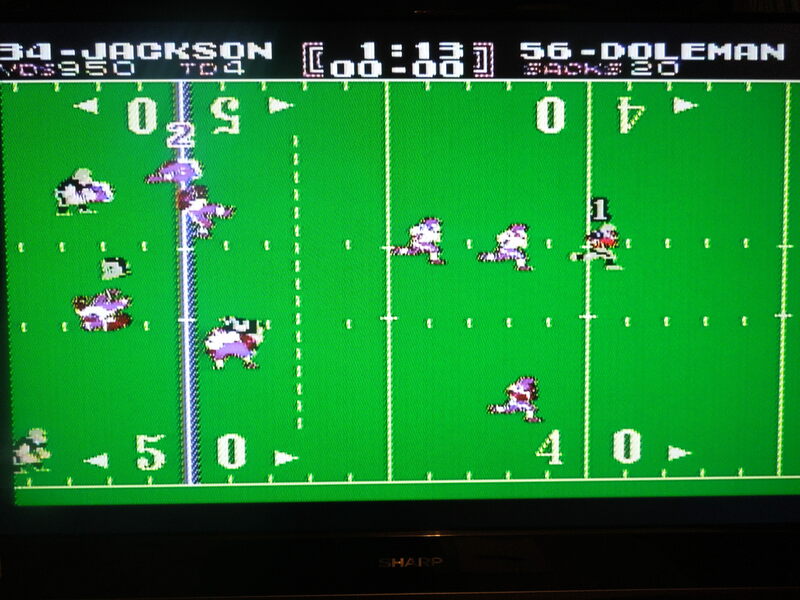 As if Bo Jackson’s Tecmo Bowl Legacy needed any improvement, he’s even faster in TB Japan. Other player changes? Oh, I’m sure. The 3 listed here are just some of the glaring ones I’ve noticed. Don’t worry, Lawrence Taylor is still a powerhouse on defense. Language Barrier? No – everything is in English. No Japanese whatsoever. So, where can I find this game? EBay. If you don’t want to bother with the original Famicom cartridge/converter like I did, you can find the rom online and plenty of NES reproduction websites on the Internet. You can also play the rom on a computer. 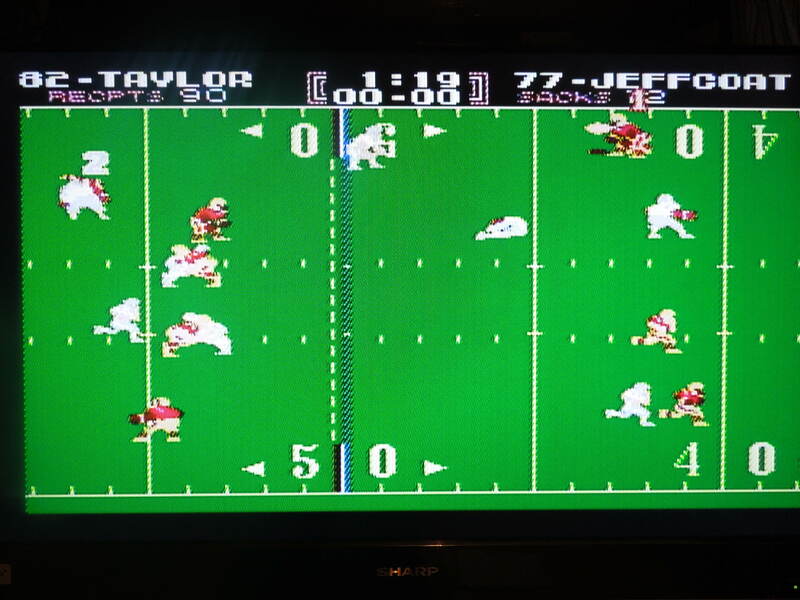 Conclusion: Tecmo Bowl Japan is basically the same game as Tecmo Bowl USA – you’d really have to be a real nerd (like me) to notice the differences. It would have been great if the Japanese version would have changed some teams or the playbooks, but all that’s different are some players with better or worse stats than their predecessors. Interesting though, and a lot of people love Tecmo Bowl, but have never heard of this version. Really liked your write-up about the 1990 Japan version of Tecmo Bowl. I picked up that version along with a famicom to NES adapter about 10 years ago, and my friends and I played it a ton. Actually it had a lot of other really impactful changes with player personnel…and more often than not it was for the worse. No Eric Dickerson on the Japan Colts is a big one. Standout LB’s Carl Banks, Wilber Marshall, Fredd Young, and Duane Bickett are merely shadows of their USA versions. Seattle did get a fast Rufus Porter at bottom LB position, and San Fran got Charles Haley at LB as well. Those guys are great. Overall it really changed the DNA of most teams. Chicago, Miami, and Denver were really the only teams that stayed nearly intact in terms of overall ability. Dallas, Washington, Indy were far worse, while San Fran version rose up further in our rankings. Big Time kick returner Gerald McNeil of the Browns was replaced by slow Mike Oliphant, but the Browns got much faster at WR and also got a faster Clay Matthews at LB…so it became a push of sorts. However Japan Tecmo overall had a larger assortment of big time KR’s than the USA version though, so it evened out. We play our own 12 game seasons in 2 player mode, and alternate with the USA and Japan versions, so it really gives us a nice variance. Recently got a rom made that combined the 2 versions, so we can have a Japan 49ers vs USA Giants game for instance. That’s really cool, because for years and years before that, we could only theorize what might happen when such match-ups were to occur…now we can play them out. 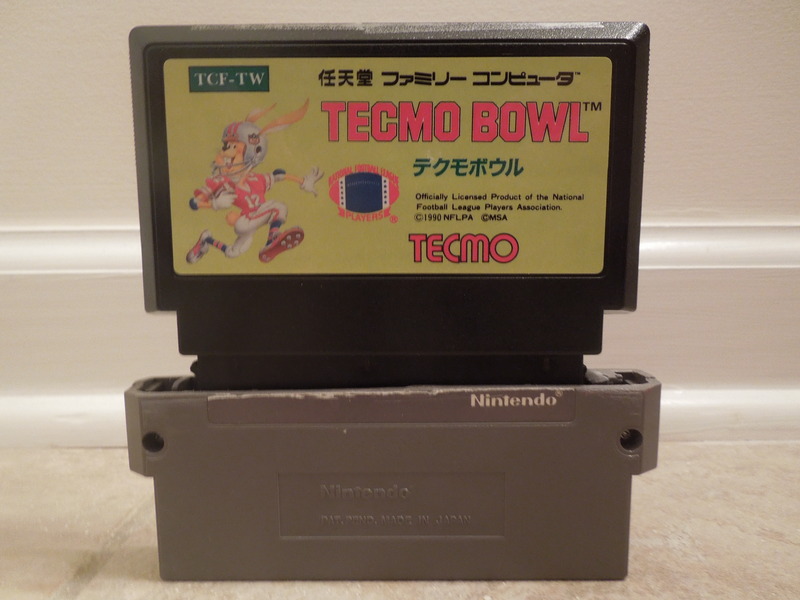 This entry was posted in Famicom - Tecmo Bowl Japan and tagged Tecmo Bowl Japan Review (Famicom). Bookmark the permalink.